Organizing and backing up photos is an important task for all smartphone users. Google Photos are certainly the most obvious choice for the majority of Android photo enthusiasts. With lots of amazing features and multiplatform reach going for it. The list of great features is long and includes hi-quality (16MP photos and 1080p videos) backups, automatic albums, AI assistance for improving and tweaking photos and videos, and of course, geo and people tags in photos. 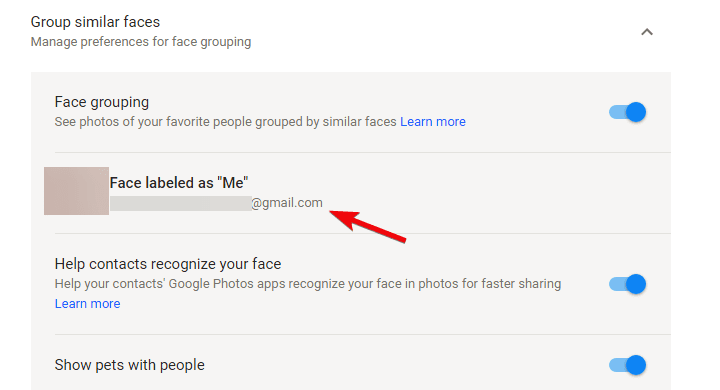 We’ll try to expand on the face recognition and explain how to tag people in Google Photos without making it a chore. Let’s start with the frequently-mentioned major drawback. In comparison to the discontinued Picasa, you can’t tag people in photos on your own accord. The machine learning algorithm recognizes and groups people before you can assign their names. Once it collects all photos of an individual face, you can apply tags. Due to privacy laws, this feature is not available in most Europan countries. You can enable it with a VPN, by choosing a USA server. This is only a one-time procedure, and you can ditch the VPN later on. 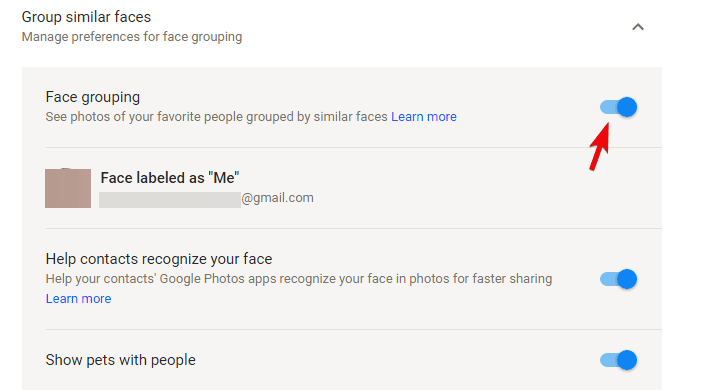 Once you’ve done it, make sure to enable Face Grouping and associated options in Google Photos settings. Download and run any free VPN service on your PC (like TunnelBear or similar clients). You can also use proxy browser extensions. Run the VPN and connect to a USA client. It doesn’t matter where in the USA. Open your PC browser and navigate to Google Photos for the web, here. Sign with your Google account you use for Google Photos on your phone. Click on the hamburger menu in the top left corner and open Settings. Expand Face Grouping section and enable Face grouping. You can also add pets to People group as the engine can identify and distinguish pets, too. Disable VPN and close it. It served its purpose. Now, just wait for a prompt. Once we dealt with that segment, the next thing you should do is wait. The machine learning algorithm needs some time to recognize and gather all faces. And the more photos you have, the longer you’ll need to wait. I had to wait 3-5 days for 1800 photos, but this isn’t a rule. When the faces are finally grouped, you’ll be asked to tag them. Firstly, you’ll need to assign your account to your face. After that prompt, you can assign names to all recognized faces. Open Google Photos either on your phone or PC. Choose yourself from the list of recognized faces. Now, close Settings and open Albums. Open People (or People & Pets) album and you should see all recognized faces. Click on the individual person and assign a name to it. It can be a nickname or anything else which fits your liking. After that, you can search for a person and all the photos of that person will appear. Which is, in our humble opinion, very nice. Finally, if you’re waiting and waiting and nothing happens, we see only 3 available options. 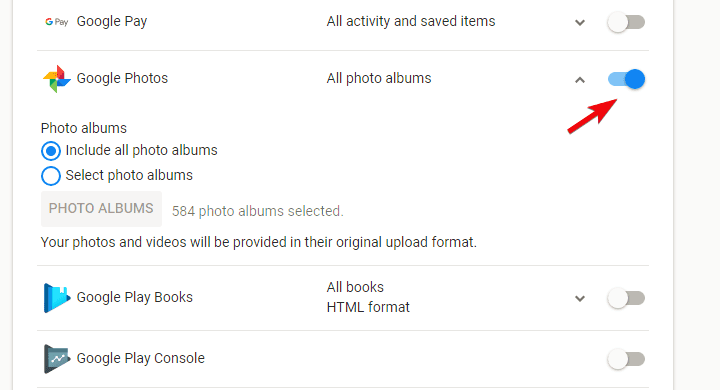 The first one is to keep on waiting, the second requires you to disable and enable Face grouping again, and the third one, sadly, suggests removing and reuploading all photos in Google Photos app. We’re aware that the third option isn’t the one preferable, but it seemingly worked for some affected users. You’ll need to use your PC to download all photos and re-upload them again with Face grouping enabled. Of course, depending on your bandwidth speed and the number and quality of photos, this can take a lot of time. Open the internet browser on your PC. Navigate to “Google Takeout” site, here. Toggle only Google Photos and click Next at the bottom. Download the whole archive and save it on your PC. Now, open Google Drive, here, and delete the Google Photos folder. Open Google Photos in a browser or download the Backup & Sync client for Windows, here. Wait until the machine learning algorithm groups faces. With that said, we can conclude this article. Don’t forget to share your thoughts about Google Photos or add an alternative way to solve the recognition issue. You can do so in the comments section below.